1. Sintered Neodymium magnet (Neodymium-Iron-Boron) rare earth magnet is the strongest magnet in the world up to date, with high fluxdensity and high coercivity, the range of energy product is 26 - 48MGOe. Sintered Neodymium magnet is anisotropic and only magnetized in one direction. 2. Produced by powder metallurgical method with chemical composition of NdFeB. Excellent cost to performance ratio. Reasonable temperature stability. Very brittle & hard. High resistance to be demagnetized. Poor corrosion resistance to be corrupted. Not suitable for application which is exposed in high temperature conditions. Widely used in motor, separator, lifting, sensor, loudspeaker, MRI, VCM, and other electronics, automation systems. 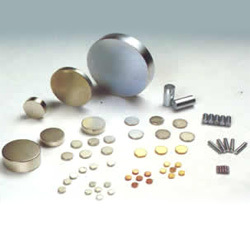 Specialized in producing various types of Neodymium magnet (N30-N45, N30M-N45M, N30H-N42H, N30SH-N40SH, N28UH-N35UH, N24EH-N28EH).